Pressure, pushing down on me, pressing down on you. So the famous Queen song goes. But while many elementary school students’ hands may shoot up when asked the question “How are diamonds formed,” the commonly known answer of coal being placed under extreme pressure is, in fact, incorrect. Queen did get the first part right, however; extreme pressure, but also heat, are the two main processes needed to form this colorless gemstone. That’s right; forget everything your grandfather may have told you about diamonds coming from coal. (Though the common misconception has made for some hearty laughs.) Rather, the brilliant gemstone requires a different form of carbon to be formed. Diamonds are crystals of pure carbon that have formed under a combination of high temperatures and extreme pressure in the Earth’s mantle. Which in turn, as they aren’t found on the Earth’s surface, requires diamonds to mined in order to be located. How hot is hot and how deep down into the Earth’s mantle are diamond’s formed? From 90 miles below the Earth’s surface and even farther downward, these sparkly stones are formed. But it doesn’t just take “Ouch, I burned my hand on the stovetop!” heat to make a diamond. These stones require at least 2,000 degrees Fahrenheit (or 1,050 degrees Celsius, for those across the pond) for their formation. To put that in perspective for you, the surface of the sun is said to be about 10,000 degrees Fahrenheit. But how do diamonds work their way toward the Earth’s surface other than mining? Some diamonds make their way to the surface because of volcanic eruptions. Yes, this is true and isn’t just some folklore grandpa told you. But it is a very specific type of volcanic eruption that helps the gemstones work their way to the Earth’s surface. Violent and deep-seated in the mantle, the eruptions carry already-formed diamonds from the upper parts of the mantle to the Earth’s surface. Upon reaching the surface, the magma from the eruption cools into what is known as kimberlite and lamproite rocks. It is from the former type of igneous rock that many of the world’s diamonds are found — not from coal. Don’t create a dig zone in your backyard just yet in hopes of hitting the jackpot by finding some diamonds! While it does take extreme pressure and high heat to form the colorless gemstone, the environment they need doesn’t occur in the mantle everywhere across the globe. Along with the scalding temperature of 2,000 degrees Fahrenheit, diamonds are said to be formed in “diamond stability zones” in parts of the upper mantle beneath the stable interiors of continental plates. If this environment were common, everyone would be rushing out looking for diamonds in their yard. But, as it takes many factors to produce a diamond, this specific environment has only been found in a few parts around the world, primarily South Africa. Which, coincidentally, was where the first kimberlite rock was found, in Kimberley, South Africa. Though there are a few other ways that diamonds are created in nature, the pressure and heat pushed down on carbon, in conjunction with deeply formed volcanic eruptions, cause the clear-cut gems to form. 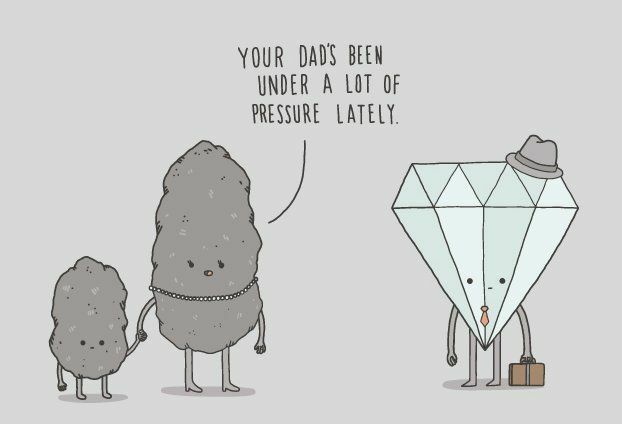 Next time you’re feeling under pressure, be thankful you aren’t made of carbon. But, as Marilyn Monroe once said, “Diamonds are a girl’s best friend,” and while the Earth exerts a lot of effort in creating the stone used in the engagement ring of many, one thing is certain: coal has never been a part of that process.